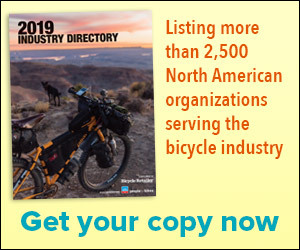 SCOTTS VALLEY, Calif. (BRAIN) — Fox Factory Holding Corp. announced Thursday that its bicycle-related sales — through its Fox Factory, Marzocchi, Race Face and Easton brands — was up 2.9 percent in the second quarter, which ended June 30. OLATHE, Kan. (BRAIN) — Garmin on Wednesday reported a 1 percent rise in second-quarter revenue, to $817 million from $812 million a year earlier, that included a 46 gain in its outdoor segment driven by strong demand for its Fenix smart watches. HELSINKI, Finland (BRAIN) — Amer Sports' cycling business, done through its Mavic and Enve brands, was down 12 percent in local currencies in the first half of the year, and down 18 percent in the company's second quarter, the company is reporting. But Enve sales were up in the half. OSAKA, Japan (BRAIN) — Shimano is reporting that its bike-related sales were down 2.7 percent in the company's first half, which ended June 30. Operating income in the segment was down 11.5 percent. HEERENVEEN, the Netherlands (BRAIN) — Accell Group reported that sales through the specialty channel in North America during the first half of the year were down. It also saw sales impacted by the closure of multi-sport retail chains. Company seeks growth through acquisitions in consolidating trade show industry. SAN JUAN CAPISTRANO, Calif. (BRAIN) — In its first conference call with investors since its public offering in April, Emerald Expositions president and CEO David Loechner was optimistic about growth through acquisitions of shows and further consolidation in the B2B trade show industry. TAICHUNG, Taiwan (BRAIN) — First-quarter revenue at Giant Manufacturing, the world's largest producer of bikes, continues a downward trend pointing to what could be another tough year for the industry. MONTREAL (BRAIN) — Dorel Inc.’s bike division on Friday reported a drop in first-quarter revenue but said operating profit almost doubled to $10.1 million as margins improved and the division’s restructuring, including a 4 percent workforce reduction, reaped benefits. SCOTTS VALLEY, Calif. (BRAIN) — Fox Factory Holdings reported a 32.6 percent increase in sales in its fiscal first quarter and has raised its guidance for the second quarter and the full fiscal year, for both sales and earnings. OLATHE, Kan. (BRAIN) — Garmin on Wednesday reported a 2 percent gain in first-quarter revenue, to $639 million, as sales growth in its outdoor, marine and aviation segments countered declines in fitness and automotive sales. SAN MATEO, Calif. (BRAIN) —GoPro on Thursday reported a first-quarter loss of $111.2 million on revenue that rose 19 percent to $218.6 million, topping the company’s guidance for the period. HELSINKI (BRAIN) — Amer Sports Corporation is reporting that its cycling sales — comprising business by its Mavic and Enve brands — were down 5 percent in the January through March period, compared to the same period last year. HEERENVEEN, Netherlands (BRAIN) — Accell Group, which planned to hold its annual meeting of shareholders on Tuesday, said its sales in the first months of 2017 were at the same level as last year.